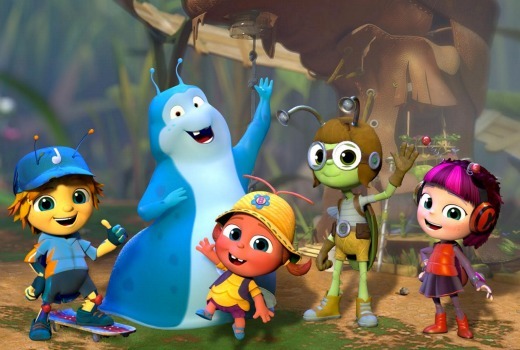 The Beatles will finally get to be beatles -or at least their music will be set to a new animated kids series Beat Bugs, which will premiere in Australia on Presto later this year. Beat Bugs which will feature some of The Beatles best-known songs woven into the narrative of each episode, including Help!, Lucy In the Sky with Diamonds, Sgt. Pepper’s Lonely Hearts Club Band, and Magical Mystery Tour. They will be performed by acts including Eddie Vedder, P!nk, James Bay, Sia, The Shins, Of Monsters and Men, Chris Cornell, Regina Spektor, James Corden, Daniel Johns and Birdy. The Beat Bugs are described as charming, funny, adventurous, and have a knack for getting themselves into mischief and mayhem. Each of the five friends (Jay, Kumi, Crick, Buzz, and Walter) has a distinctive personality, and they display the charm and energy of five knockabout, lovable kids. They are best friends who band together to explore and learn in an overgrown suburban backyard, which to them is their entire universe. The series is the brainchild of Josh Wakely, who will direct, write and produce the series, produced by Grace and Vancouver-based Thunderbird Beyond Screen Productions. Seven is an investor in the series, which will see it debut on Presto. In all other markets it will premiere on Netflix. Josh Wakley’s Grace is based in both Australia and the US.